The Wiesbaden exhibition shows more than 50 paintings that focus on Feuerbach’s model Anna Risi, bringing together all the well-known portraits of Nanna in order to make the woman behind these depictions visible. The starting point for this is one of the most important paintings of the Museum Wiesbaden, Nanna, profile to the right, from the year 1861. With the exhibition Feuerbach’s Muses – Lagerfelds Models, the Hamburger Kunsthalle presents an unusual double show on grace, eroticism and the worship of muses and models, bringing together paintings by Anselm Feuerbach with previously unseen photographs by Karl Lagerfeld. 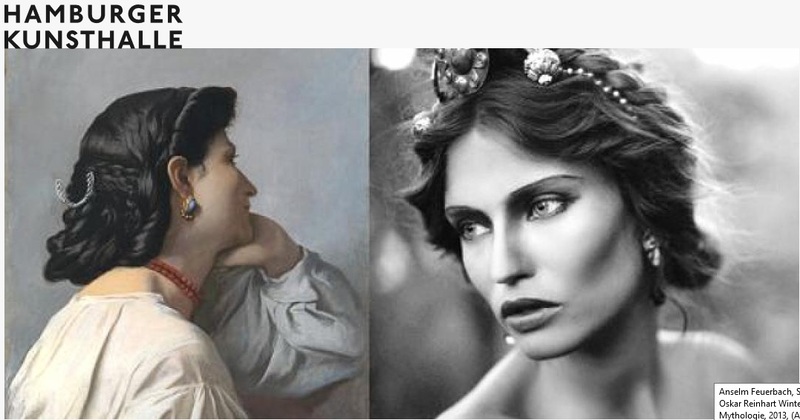 Similarly, Feuerbach and Lagerfeld seek an update of the ideal, timeless beauty established in antiquity. The exhibition focuses on the cult of beauty, which stylizes the model as an icon. Feuerbach’s more than forty works, mainly from the years 1860-70, can be seen in the exhibition. The works are on loan from the Feuerbachhaus Speyer, as well as numerous German, Swiss and Austrian museums and private collections. Karl Lagerfeld created a series of around sixty black and white photographs especially for the exhibition. The presented works are predominantly of large format and were printed in an elaborate process on silver and gold-colored fabric. Anselm Feuerbach (1829-1880), one of the most important German painters of the second half of the 19th century, lived in Rome from 1856 onwards. The city, with its splendid architecture and the surrounding heroic landscape, was a place of longing that seemed second to none for reviving the classical ideals of antiquity artistically. Feuerbach devotes himself to antique subjects and at the same time fills them with imagination and personal feeling. The most exciting is the series of unique portraits begun in 1860, depicting Anna Risi, called Nanna, who was admired by Feuerbach as a model and muse. The artist painted Nanna in a variety of roles and sensitively designed productions, which testify to a nearly cultic worship for his model. After Nanna Feuerbach left in 1865, followed her model Lucia Brunacci. Like Nanna, her Greek profile and full dark hair matched the classical ideal of beauty of the time. Lucia inspired Feuerbach to create imposing representations of mythological themes that are the culmination of his oeuvre.